"Farinata is a gluten-free Italian flatbread made with chickpea flour that is very easy to make. I'm sure this recipe will become part of your regular repertoire. 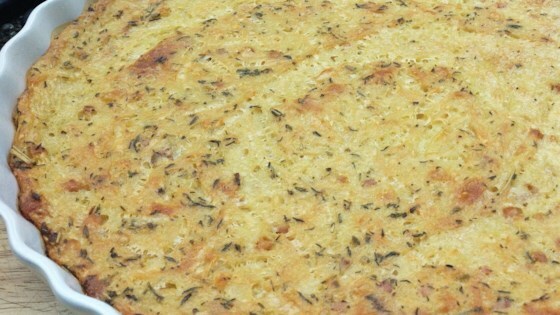 I have added some spring onions and garlic for a more gourmet version of the simple farinata." Preheat the oven to 400 degrees F (200 degrees C). Brush a 9-inch tart pan with 2 tablespoons olive oil and place in the oven to warm up. Melt 1 tablespoon butter in a medium skillet over medium heat. Add green onion and garlic. Cook and stir until softened, about 5 minutes. Remove from heat. Mix chickpea flour with lukewarm water until smooth. Set aside for 20 minutes at room temperature. Skim foam from the top of chickpea-water mixture. Add remaining 2 tablespoons of olive oil. Mix in onion-garlic mixture. Season with salt, pepper, and nutmeg. Add Gruyere cheese and mix well. Remove tart tin from oven and pour in chickpea mixture. Bake it in the preheated oven until crispy, about 15 minutes. Remove from the oven and cut into triangles before serving. Easy & super tasty! Love it.